I came away from a recent conference which focused on using one “platform/toolset” for every job. Imaginable. Even if it didn’t really work as well as another tool. My takeaway from that conference was that I don’t want to be that type of educator. Ever. And you shouldn’t either. If a certain tool doesn’t do the job even though we really really want it to then don’t use it and find an alternative. I’ll give a prime example of this that just happened to me this week. 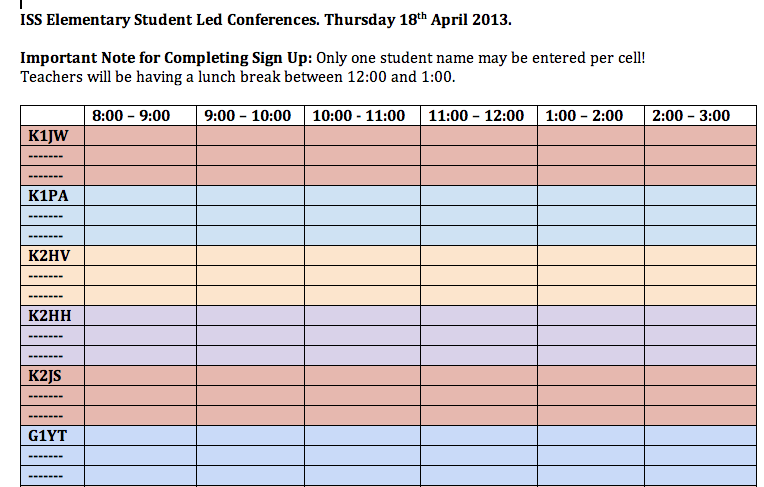 We are nearing student led conferences here and we needed a sign-up form for parents to book an allotted time. We only wanted three spaces available per hour. I got cracking on a Google Doc. Couldn’t do Google Forms as that would entail having to sort out the entries after the fact and also parents would not know if all the slots were taken or not. 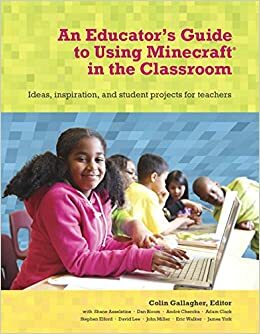 I tend to turn to Google Apps as it is very very good at a lot of things and I really want to build the culture of using it and getting used to it in my school. Nothing wrong with that. It’s easy on the eye and there are three cells for every class per hour just like we wanted. Then we got thinking about how much better it could be. The major problem was that every cell was editable by anyone with access to the document. This left us open to mistakes, accidents, slips of the mouse/keyboard. Basically, the tool was not giving us any assurance that the job we wanted it to do would actually work 100%. Sure, we could have backtracked any mistakes by the end user with “revision history” but why should we have to rely on fixing things when the tool shouldn’t give the end-user the chance to make mistakes. In the meantime, our principal got an invite from our High School to schedule her son in for his student led conference. They were using something else, a third party website (www.signupgenius.com) specifically tailored to scheduling meetings with defined slots. Let’s do this. After an hour I had thrashed out a template and had tested to see if it met our needs. I passed it on to our VP and Principal to see if they felt the same. They did. As you can see it is made for the job at hand. There are defined number of slots and once those slots are full then nobody can mess with that. I’m writing this as the form has gone live and already we had a parent sign up for all 3 slots in a given hour! No problem as administrator I can delete two of those and those slots are made available again. It’s exactly those types of mistakes that we didn’t want to happen in a more openly editable tool like our Google Doc Version 1.0 form. To be honest, though, parents who have made appointments and wish to change them have found it difficult to do so (it can be done) so thinking about the Google Doc signup form version 1.0 this would have been an easier way for them to change their timed appointments. We will sit down at the end of it all and reflect and assess what we can do better next time. Always learning. So while I was going through this process I thought back to the rigidity and inflexibility that some companies would like you, as an educator, to adopt in your teaching. Our school relies on Google Apps every day for communication and collaboration (for starters). I tend to want to use Google as a solution for everything and, in most cases, it works perfectly well! In this instance we found something that was more suited to the job at hand. This is the right way and the real way problems need to be solved. We should be constantly scanning the horizon for solutions that we do not have yet. We should not rely on “platforms” or “software suites” to solve everything. We should be flexible as educators so that our students can develop the same mentality when it comes to problem solving.